I wonder why Japan insists on killing whales, despite a lack of a rational reason to keep at it. The “scientific research” is a total fib. It is not just Greg Hunt and Greenpeace who say so. 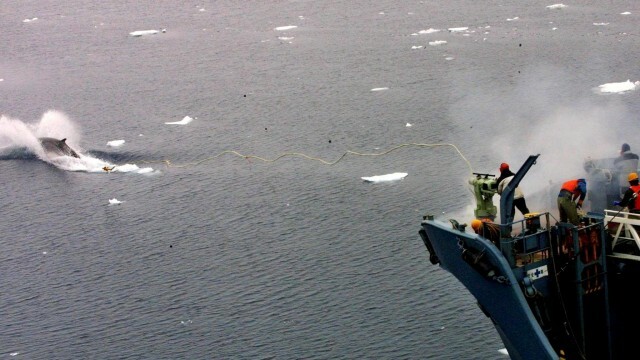 Last year, the International Court of Justice ruled that that Japan’s scientific whaling program is a way to carry out commercial whaling and is not intended for research. In fact, it was out of sheer embarrassment at the ruling that Japan cancelled its annual whale hunt last year. One may argue that Japan wants to whale for commercial reasons. But this doesn’t hold true on inspection. The whale meat is obviously not for export, unless countries around the world are secretly organising raucous “minke whale meat” orgies behind our backs. Another popular argument quoted is that whaling is a part of Japan’s culture and tradition. But so was hara-kiri (a ceremonial murder-suicide involving voluntary disembowelment). The practice was abolished in 1804. They have also abandoned the practices of Ubasute (abandoning their elders by leaving them on some remote mountain), Junshi (female ritual suicide after husband’s death), Kamikaze (Japanese suicide bombers) and besides, given that they are not eating much whale anyway, why are they hell bent on sticking to this particular practice? The answer is sheer cussedness. I come across this attitude in my daily life – from my stubborn four-year-old, who doesn’t like being told what to do. Every act of negotiation goes through several stages: starting from reasoning, appealing to her better side, glaring, scolding, and taking it to a higher authority; that is, Daddy. Usually, one of these stages holds the answer. But sometimes…sometimes, the more we shame her, the more determined she gets to keep doing it. Unfortunately, with Japan I feel we have reached this stage. We have tried reasoning, appealing to their better side, publicly condemning and appealing to a higher authority, that is, International Court of Justice. But with each successive stage, we have only managed to make them more determined to hold on to the practice. If we continue on this course of action, the only choice left is to cut off all trading relations and declare war. Greg Hunt might want to chat about that option with Andrew Robb, our Minister of Trade, who is still basking in the glory of his success in getting Japan to finally open-up its lucrative beef market to us. Maybe what Australia (and the rest of the world) should do, is what we do with Chook-Chook when we reach an impasse. We use reverse psychology. We let her know we don’t like her behaviour and then we studiously ignore it. In no time, her defiance deflates and she moves on to other things. Let’s give Japanese whaling the royal ignore. We can let them know we don’t approve of the practice but have nothing more to say to them on the issue. There is no real appetite for whale meat in Japan, but there is a lot of appetite for a fight. Let’s kill it by simply ignoring it. It works with Chook-Chook each time. Take it from Mummy, it will work with Japan too. It does sound like it might work, but I’m sure there’d be a hell of a lot of extinction bursts, and that makes me sad for the poor whales. Surely we as a global community can find a way to hold the decision makers personally responsible for breaking international law. That might make them think twice.